What a totally summery February! I've been sending smug pictures of myself on the beach to all my shivering amigos in New York. Ha, ha, suckers! However we all know this weather is not built to last, as is evidenced by the plethora of winter vegetables still plaguing the larder like the last drunken guest. It may be summer weather but summer produce is still far away. My mounting rage at tubers has been somewhat ameliorated by alliums, the family of plants that includes onions, garlic, chives, shallots, scallions, and most excitingly, leeks. (!!!!!) Big huge piles of steaming buttery caramelized leeks, glistening and flecked with pepper. Crispy little fairy-like fried shallots, fragrant, rich and salty-sweet. And onions. Oil and roast an onion, wrapped in foil. With relatively little added fat, they melt into a sweet jammy-textured treat that tastes amazingly rich eaten with a fork and knife. With buttered bread, it's a delicious and frugal lunch. Recently, I've been enjoying the crisp sharpness of raw onions as well. It's true, they are strong, but the sharp watery bite is reminiscent of radishes and wasabi, and is easily mitigated by slicing thinly and layering on buttered brown bread with a little salt. Just ask your hot date to please remain three feet away at all times for the eight hours post-prandial. Roasted garlic has been a standby as a spread for ages, and deservedly so. But alliums can move far so beyond that. The '80s are over! We're all sick of Provencal cooking! Can you believe in the '50s they recommended you remove the garlic clove before serving? Thank goodness we live in these enlightened times, when no one thinks I'm weird for munching a handful of chives. I am particularly fond of chives because they are very easy to grow in a tub, and they are mild and spring-like even in the winter. I do love all alliums, but it must be said leeks and garlic usually require cooking to mitigate toughness and flavor. Chives are more accessible. I keep a handful of chives in a glass by the sink, where they look beautifully green. Their tender mild flavor, redolent of onions, garlic shoots and grass, adds color and flavor to almost any dish: on top of toasted English muffins with melted sharp cheddar (my favorite), bagels and cream cheese, eggs, curried eggplant, poached salmon, etc. Finely minced and mixed with mayonnaise, they make a versatile and colorful sauce. They would be a nice addition chopped and sprinkled on any of the recipes below. I sometimes use this instead of pasta under sauce, or of course just on its own. 2 leeks, chopped into 1/2 in. slices up till where the leaves separate. Wash carefully to remove grit. Heat a cast iron pan 'til the handle is warm over a medium flame. 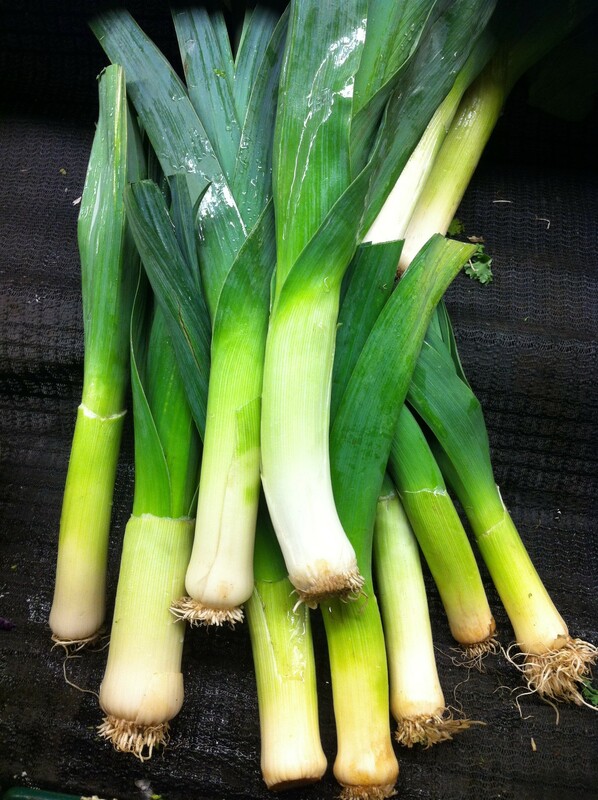 (Choose one large enough to allow all the leek slices to remain flat.) Add oil. Add butter. Once melted, add leeks, and arrange them in one layer. Lower heat slightly. Cook without moving for 2 minutes. Use a fork to flip one; is it browning? If not, cook another minute. Once you see they are brown, flip them all so the other side browns, another 3 minutes. Sprinkle on the sugar and salt and pepper and give them a good stir to loosen and separate rings somewhat. About 45 seconds more, and Bob's your uncle. Serves 2. Preheat oven to 350. In ceramic baking dish, toss all ingredients. Bake covered for 70 minutes. A very intense, vivid sauce, excellent when used sparingly alongside steamed fish or chicken. Pound into paste in mortar with pestle. Serves 4 (doesn't take much). So cheap! So nummy! And all stuff I always, always have on hand. You could also add a handful of chopped dark leafy greens. Heat up the oil in a 10-inch cast iron pan over a medium flame; sauté the onion 'til translucent; add remaining ingredients except cilantro and simmer for 15 minutes, adding water if liquid evaporates. Sprinkle with cilantro and chives and serve, with rice if you like. My childhood favorite. From A Cook's Guide to Growing Herbs, Greens and Aromatics by Millie Owen. Sauté leeks and butter in a big heavy saucepan, stirring 'til limp. Peel and dice potatoes and add. Pour in broth. When potatoes are tender, place greens in blender, pour hot leek and potato mixture over and blend (I have to do it in batches in my li'l blender) just until potatoes are fairly smooth. Stir in cream and season to taste. Peel shallots and slice into 1/4 in. slices. Heat oil in a small cast iron pan over medium flame until hot but not smoking. Fry shallots in batches until crisp and just brown. Drain on paper towels, salt, and eat immediately.